As many of you right now, the <canvas> element is one of the most popular additions to the HTML5 standards. It is widely supported by popular browsers like Firefox, Chrome, Safari and Opera (Internet Explorer supports it in their IE9 beta version). 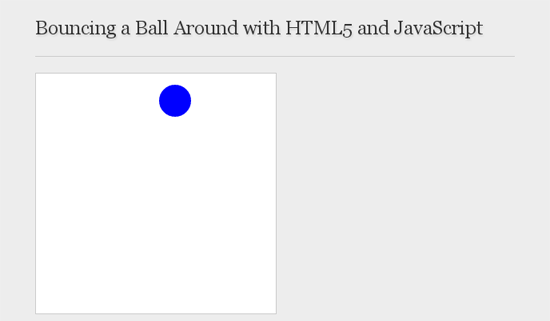 This guide will explore the use of HTML5’s <canvas> element through a fun example: bouncing a blue ball around. To start, you will need to create a basic HTML document. It’s best if you follow along with me as we go — so go ahead and create your HTML document now. Save the HTML file and open it in a browser that supports <canvas> and HTML5 (latest Safari, Opera, Chrome, and Firefox versions) so that you can preview the code. If everything is fine, you should be seeing a blue circle that has a radius of 20px (or in other words, 40px in diameter). Save the file and test your work in your web browser. Uh oh — Houston, we have a problem. The circle is actually forming a line (see the image below). This is because each time the draw() function is called, it draws a circle at the new coordinates without removing the old ones. That’s how the getContext object works so it’s not a bug; it doesn’t really move the circle and, instead, it draws a circle at the new coordinates each time the function is called. To erase the old circles, we’ll need to call the clearRect method right at the start of our draw() function so that it clears out the previous circle before it draws the new one. Save the file and refresh your browser and see the ball move out of the screen nicely. Now it’s time to bounce the ball off the corners of the <canvas> element. Well, that’s easy: All you need to do is check if the values of x and y are beyond the canvas dimensions, and if so, we need to reverse the direction by setting values of dx and dy to the negative values. 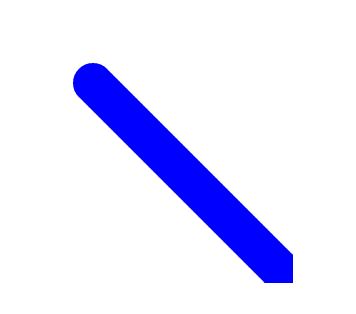 If all goes well, you should see a ball bouncing around the four corners of the canvas element (like in the demo). Awesome, right? This bouncing ball is a fundamental concept to many of the game development logic and it can be easily extended to build a ping-pong game or a breaker-type of game.